"Construction and Evolution of the Union Theological Seminary Campus, 1908-1910", Columbia University, October 2015. Union Theological Seminary was founded in 1836, originally located in downtown Manhattan. It moved to Park Avenue on the East Side of New York City in 1884, but a decade later the Seminary was in desperate need of new space. Morningside Heights near Columbia University was a natural choice. After a competition among architects, construction began in 1908 and was completed in 1910. 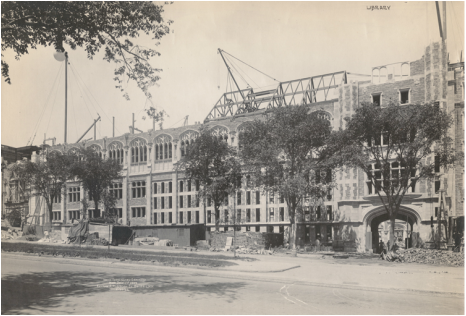 This digital exhibit shows the construction and evolution of the Union Theological Seminary campus. Original photographs were digitized by Columbia's Preservation & Digital Conversion Division. I facilitated the scanning, and worked with the Libraries Digital Program Division gathering metadata and preparing the Omeka exhibit. BibID: 11612867. The unification of the Church of South India in September 1947 is considered one of the most important in the Church Union movement because, for the first time after centuries of division, churches with various ministries were brought together in a collective Episcopal Church. The reconciliation it reached between Anglicans and other denominations on the doctrine of apostolic succession is often cited as a landmark in the ecumenical movement. 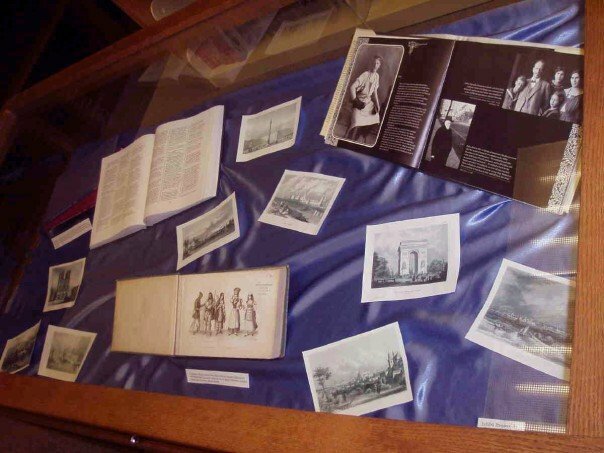 This exhibit depicts not only the road to unification in South India, but also the efforts that the Burke Library at Union Theological Seminary took to trace the history and ownership of the collection, while preserving and making the film available to researchers. This digital exhibit grew from the need to preserve deteriorating film strips in the Missionary Research Library Archives collection. The film strips were scanned as high quality images. I worked with the Conservation Department and the Libraries Digital Program Division gathering metadata and preparing the Omeka exhibit. “Art in the Archives,” Historical Society of Frederick County, Spring 2011. I designed this exhibit case to compliment the Museum's temporary exhibit, "American Vision: Select Art Works from Frederick County." “K. Leroy Irvis,” Collections Conservation Course, University of Pittsburgh, Summer 2008. “The Dean Is At It Again: Dutcher Hall,” Millersville University, Spring 2007. Dutcher Hall is the oldest-standing building on Millersville's campus. I created a physical exhibit that was on display in the Archives and Special Collections. I also wrote a complimentary article for the Friends of Ganser Library's publication, Friends Folio. It was then turned into an online exhibit, linked above. A reception was held in 2006 to recognize C. Richard Beam's work at Millersville. 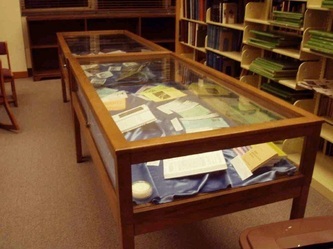 The Archives and Special Collections housed a collection of Beam's work. I created these display cases for the reception, which were then transferred for display in the Library. 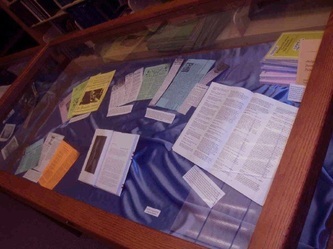 Annual Alumni Weekend Exhibits, Millersville University, 2004 – 2007.